Longchamp racecourse on the outskirts of Paris is the scene for what could potentially be a historic day for flat racing. Two-time victor Treve goes for an unprecedented third victory in the Prix de l'Arc de Triomphe on Sunday. Here I consider whether another win would make Treve the greatest, the showdown with rival Golden Horn, and other potential challengers. 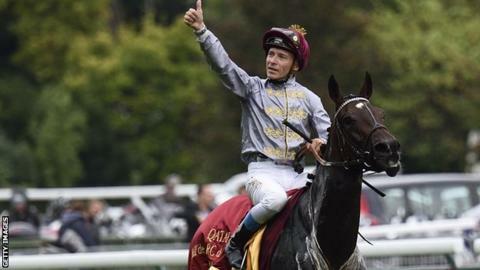 Would third win make Treve the greatest? Different people use different criteria to assess greatness. In the cases of two of the sport's recent undisputed 'greats', Frankel achieved the loftiest of reputations with a famously unbeaten career of 14 successes from 14 starts. A year or two before it had been a shorter but equally-irresistible blaze through six prizes - all major Group Ones - that secured Sea The Stars his position in the higher reaches of flat racing's pantheon. In contrast, Treve suffered a beaten run of three defeats during 2014, losses which made it look to practically everyone except her devoted trainer Criquette Head-Maarek as though the mare was both down and out. But not only was she capable of bouncing back, she did it when positively sweeping aside the very best in the Prix de l'Arc de Triomphe, Europe's most significant horse race, becoming only the seventh horse to take two stagings of the mile-and-a-half-long championship. The five-year-old is, therefore, actually already a 'great', so a third successive Arc success would bestow genuine, never-to-be-forgotten 'legendary' status on the Al Shaqab Racing-owned star. And she'd have to be considered the outstanding female racehorse of all time. Age: 5 (Born 7 April, 2010). Golden Horn, Frankie Dettori's big-race mount, is rated second best in the world, behind US Triple Crown hero American Pharoah, but three places in front of Treve. And officials believe he's capable of conceding weight to his rival. However, the conditions of the Arc state that, just like all contenders aged three, Golden Horn - winner of the Dante Stakes, the Epsom Derby, the Eclipse Stakes and the Irish Champion Stakes - is the one that carries the lower burden. Drying ground at Longchamp will also suit the John Gosden-trained colt, whose owner/breeder Anthony Oppenheimer has forked out a 120,000 Euro (£88,000) late-entry fee. Treve's best form is on softer going, but the mare's fans have themselves questioned Golden Horn's most recent efforts, a first-ever defeat at York in August and a perhaps fortunate win in Ireland in September. Could a long and examining campaign be taking its toll? Contrastingly, Treve arrives at the Parisian racecourse, where she's won five times, off the back of a breathtaking victory in the track's Prix Vermeille in September, and unquestionably in the form of her life. Golden Horn, the son of the stallion Cape Cross beat fellow Arc hopefuls Found and Free Eagle by one length and half-a-length in the Irish Champion Stakes, but those finishing positions don't tell the whole story. Inside the closing stages of the mile-and-a-quarter-long race the winner swerved violently to his right, bumping and severely impeding Free Eagle, effectively ending any chance of that horse adding to his Royal Ascot win. There was a stewards' inquiry, but a) as the 'victim' of the interference had finished third not second, and b) because Golden Horn still won well, the placings weren't amended. That said, the rematch with Free Eagle, trained in Ireland by Dermot Weld and the mount of the Weld stable's number one jockey Pat Smullen, over a slightly longer distance, is intriguing, and plenty of shrewd fans are being tempted by the odds of 'The Eagle' at around 14-1. Dettori: Icing on gateau of triumphant year? Frankie Dettori, three times Britain's champion flat jockey, has admitted he's had to pinch himself more than once during 2015 to make certain that what is happening is indeed taking place. Because after losing his job with Sheikh Mohammed's Godolphin team in 2012 and then serving a drugs ban, the gossip doing the rounds was that the best known jockey-brand in the world had maybe reached its sell-by date. However a link up with first Sheikh Joaan Al Thani of Qatar - ironically the owner of Treve, but Criquette Head-Maarek prefers Thierry Jarnet riding - and then Golden Horn's trainer John Gosden has seen the number of Dettori's trademark flying dismounts rise again dramatically. On Golden Horn, Dettori, 44, is lining up in his 27th Arc in 28 years, the sequence broken only by a fractured ankle when all set to partner the victorious Treve in 2013. Success would be a record-equalling fourth - after Lammtarra (1995), Sakhee (2001) and Marienbard (2002) - though should it come at the expense of his boss' favourite horse, the Italian's famous Latin charm may have to go into overdrive. However, should Jarnet guide Treve to victory, he will become the first jockey to win the race five times. It's hard to see beyond the top half-dozen or so in the Arc picture. Immediately behind Treve and Golden Horn in the betting is the Andre Fabre-trained New Bay, winner of the Prix du Jockey Club, France's equivalent of the Derby, and successful in the traditionally-significant Prix Niel over the Arc course in September. New Bay coasted to victory there, and, along with last year's runner-up Flintshire, who's also owned by Saudi Prince Khalid Abdullah, attempts to give Fabre, the most successful Arc trainer ever, an eighth win. Found is in the mix based on her second place behind Golden Horn in Ireland though her stamina has never been examined over this distance. Gosden, on course to be champion trainer after a prolific year, saddles outsider Eagle Top as well as Golden Horn. They are the sole British raiders.